~* Leigh Ann Little *~: The Results Are IN!!! So I go on Facebook yesterday to share an important political message with my friends, family, and gamer pals. I'm thinking to myself at the time, "I wonder if anyone will read this?" Just then I saw a link that said, "Promote" and when I hovered over it, a little balloon popped up that said, "Tell your friends that this is important!" "Well, it is very important," I thought. "What if it gets lost at the bottom of everyone's news feed? What if nobody gets a chance to see it at all?" After a second or two I decided, "I WILL promote this post!" Not only were they assuring me that all of my friends would see it and take notice, but they were willing to offer this service for the low, low price of $7! Knowing that it was a scammy racket, I proceeded... just to see, and also to give me something to blog about. Today when I logged into Facebook, a message popped up that said, "The results are in!" and gave me a chance to see the statistics and algorithms and what-not behind the Power of the Promoted Post. And so I'll share that with you here, as a warning against promoting your posts on Facebook, and also for another chance to share my important political message with the masses. Yep, I got 1.6 times as many views (and a share!) for the price of six + months of hosting at my favorite web host. But if I got you to read my important political message, I guess it was worth it. Remember when Facebook was awesome? Greed ruins everything. 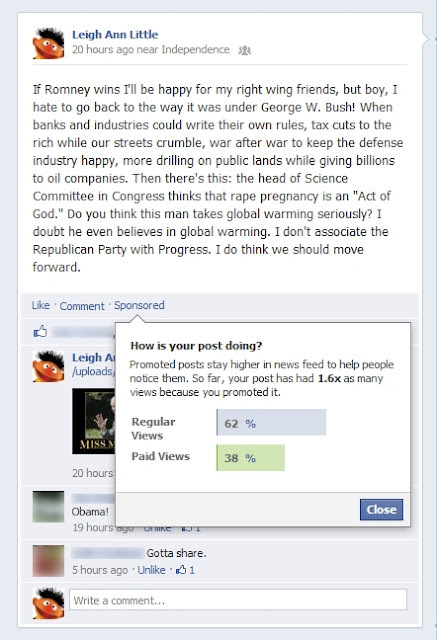 I promoted a personal post last week for the same reason: just to see what would happen. In my case, it was about a grant program that I want to promote to as many people as possible, so it was for a worthy cause. Still, I don't think it made enough difference to be worthwhile. And if Facebook would stop limiting the reach of posts, it wouldn't have been necessary at all.